Designer brand Vetements showed off their fall/winter 2018-19 collection, titled "The Elephant in the Room" in January. 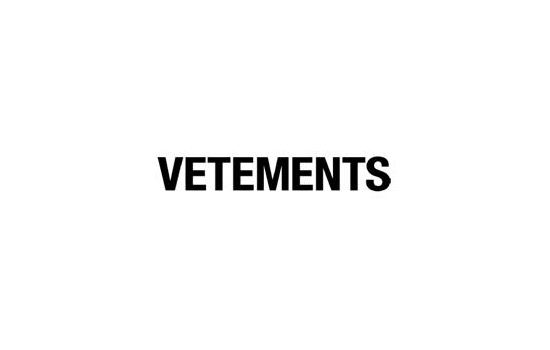 The Vetements brand logo. Photo courtesy of L'inde le Palais online shop. Since their first collection in 2015, the sort of “ironically authentic ” designer brand Vetements has put out a number of social media-breaking pieces in their collection, such as the classic sock boots, the collaboration with German shipping company DHL and the hip-high boots that Rihanna, Kendall Jenner and Dua Lipa wore. That is not all that Vetements is known for. They are constantly raved about for breaking fashion rules and putting out pieces that would generally be considered crazy and outlandish. I myself have never seen anybody rock an article of clothing from Vetements on the street, but that’s the whole point of their company: street style mixed with avant-garde themes. I generally like the pieces that Vetements puts out and think they’re brave and interesting (even if I would probably never wear them). However, with the Fall/Winter 2018 collection that dropped in January of this year, I was confused by creative designer Demna Gvasalia’s work. According to the Vetements official website, the collection was called “The Elephant in the Room.” And the name was fitting for the collection- it stood out in a way that Vetements normally doesn’t. When I first watched the runway show, which took place at the Paul Bert Serpette market outside Paris on January 19, I was a bit taken aback at just how dark and, frankly, boring it was. I saw a lot of brown and wine-colored hues, and a ton of layering. While it is a fall/winter collection, I think that Vetements could have broken the stigma that all cold-weather clothes have to be darker colors. The theme was all very similar as well, I didn’t see many patterns, and the ones that I did see were fairly subtle. The show itself didn’t really give me Vetements vibes. When I think of Vetements, I think of bright colors, sleeves that are just a bit too long and collaborations with out-of-place brands such as DHL or sportswear company Umbro. This collection reminds me more of something that other companies would put out, such as Yves Saint Laurent or Burberry. Everything that the models were wearing were very business-formal, but it still had its normal street-style type looks mixed in as well. I saw mostly dark colored articles, and a lot of brown and tan. I wasn’t a huge fan of all the models having printed scarves as the standout piece of their look. However, with my overall doubts on the collection, there were some things that I really did enjoy in it. According to the Vetements official website, Gvasalia took to a local elementary school to get drawings from Kindergarteners about what they believe the “elephant in the room” looks like and put their drawings on t-shirts. I was also a fan of the shoes in the collection. The ones that stood out to me the most were a pair of red knee high boots that had a print that looked like a wax stamp print on them and a new pair of slides to add to their collection. One of the things that I am consistently impressed with is the choice of models. Vetements has always done an exceptional job of hiring models that are not only diverse in race, but also in age and gender expression. All in all, this collection was a confusing one for me. I was impressed with some pieces, but I was also skeptical. Vetements, I would stick to your street-style type collections, because the more fancy clothes in this one just didn’t spark my interest the way that your $1,000 hoodies do.